Upon the death of his father Piotr Uzarowicz opened his father's safety deposit box at the bank. Inside he found a manuscript written by his grandmother, some photographs of an Army Officer and a postcard. The manuscript described how his grandmother and her three young sons were deported to Siberia in 1940 by the Soviet Union. The photographs were of her Polish Army Officer husband and the postcard, sent from a Soviet prison camp, was the last communication she ever received from him. Her husband was one of the nearly 22,000 Polish Army officers who were taken prisoner by the Soviet Union and later murdered in the spring of 1940. An event which has come to be known as the Katyn Massacre. In September 1939 Poland was invaded by both Nazi Germany and the Soviet Union. They divided Poland between them. In 1940 the Soviet Union deported to Siberia around one and a half million Poles from eastern Poland. Piotr's grandmother, Cecylia, was one of those sent into exile. Her husband was held captive at a prison camp, for Polish Army officers, in Ostashkov, Russia. On 5 March 1940 Stalin ordered the execution of the Polish Army officers. They were gradually taken from three prison camps, shot and buried in mass graves. In April 1943 one of the mass graves at Katyn forest was found by Nazi Germany. The Germans blamed the Soviets for the murders. The Soviet Union denied all responsibility and blamed Nazi Germany. It was not until 1990 that the Soviet Union finally admitted that the Soviet Secret Police (NKVD) had been guilty of the crime. Piotr found that his grandmother, the officer's wife, had provided a succint account in her manuscript of what happened to her. He chose to tell her story in the film The Officer's Wife. Piotr decided to tell the story from a first person perspective in order to make it relevant to a wide audience. He sought out and interviewed other survivors and members of their families. He also interviewed historians. hand drawn pencil illustrations that look like they were drawn at the time and brought to life 70 years later. [Officer's Wife website]. Information about screenings of the film are on The Officer's Wife website. 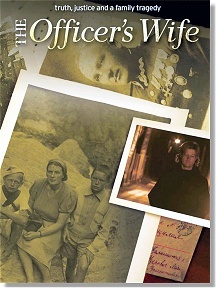 The trailer for The Officer's Wife. The Officer's Wife - Truth, Justice and a Family Tragedy. Official film website. The Officer’s Wife: A conversation with Director Piotr Uzarowicz by Justine Jablonska, Cosmopolitan Review. This page was added on 31 October 2011.